It was a heartfelt homecoming in so many ways, for so many, at the Edmonds Veterans Plaza Friday night. For an hour, local veterans — many of them Vietnam vets — remembered those who became prisoners of war or were declared missing in action during our nation’s conflicts. The occasion was national POW/MIA Day, and nearly 100 people gathered for the remembrance held in the new Veterans Plaza space, which officially opened at 5th and Bell on Memorial Day. 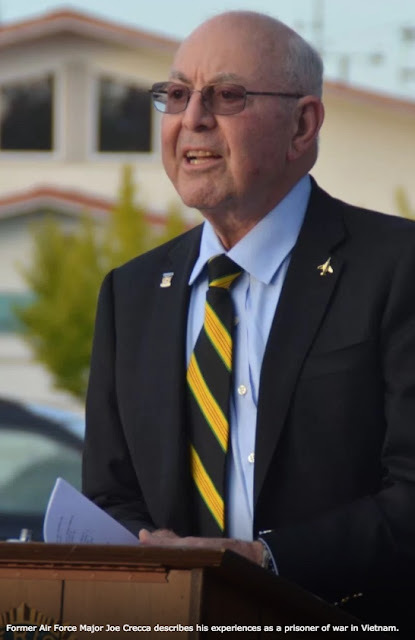 The crowd heard first from keynote speaker Joe Crecca, a former Air Force Major and Vietnam veteran who spent more than six years as a prisoner of war in North Vietnam after being shot down by a surface-to-air missile on Nov. 22, 1966.